Providing you the best range of jaya and vijaya dwarpal statue and royal palki - a palanquin with effective & timely delivery. 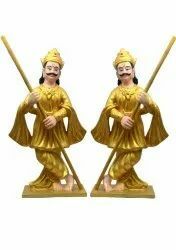 This attractive golden finishing palki, made with FRP is durable and sturdy. This palanquin has given a royal touch along with very comfortable seating. Fine quality velvet in red color along with the swan-shaped design in both the side gives it a majestic look. Used as a conveyance for God idol and also for the noble person. Approx Dimensions: Height- 64 inch, Width- 83 inch, Depth- 27 inch (H- 5.3 feet, W- 7 feet, D- 2.25 feet), Weight- 57 kg. Looking for temple related statues ?